It's a Zoo at French Run Elementary School! Even if you've been to the Columbus Zoo and Aquarium a hundred times, you still won't have seen every animal they have at the zoo. That's because there are special animal ambassadors that visit schools to talk about animal conservation and what we can do to help protect the rainforests and other animal habitats. Alex and Heather from the zoo brought eight different animals to French Run Elementary School and showed the students what makes each animal unique and able to adapt to their habitat. Percy the porcupine showed his ability to ward off danger with his quills. Salazar the snake only needs to eat once every couple of months because of his jaw- he is able to consume large prey and feast on it for long periods of time. Avery the umbrella cockatoo showed how her beak was made for cracking seeds and nuts. The umbrella cockatoo is also an endangered species, and Alex told the students ways they could help with animal conservation- everything from picking up litter to recycling to visiting the zoo, where proceeds of an admission ticket goes to help different animals. 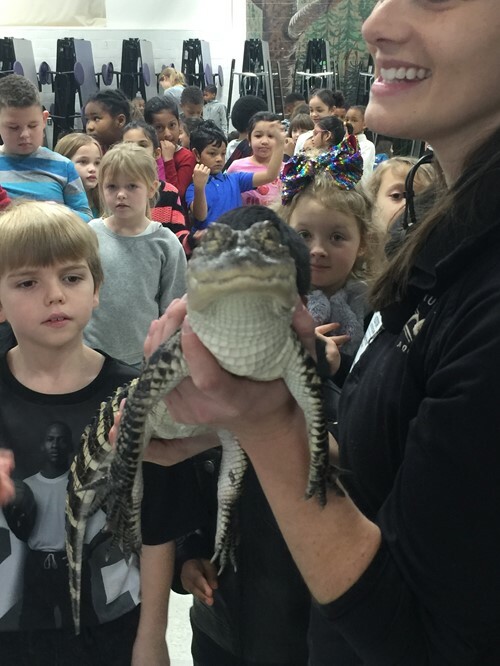 On the way out, the students were allowed to do a "two finger touch" and pat Little Foot, the American alligator. Even Dr. Baker gave him a pat!